The retreats at Casa Garuda are coordinated by the organisation holding the retreat. For more information about any retreat, please contact the retreat coordinator at the link provided. If you are interested in holding a group retreat at Casa Garuda, please contact us. Samten Kobelt will teach Daoist qigong, a spiritual discipline that cultivates body and mind simultaneously. Originally called daoyin, which means «guiding the flow of internal energy (qi)», it has been practised for over two thousand years in China. The techniques of Daoist qigong can be divided into three categories - outer, inner, and secret. 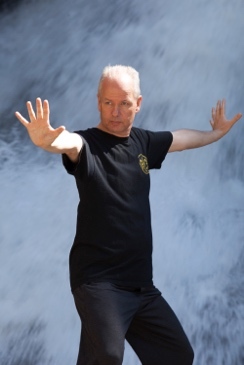 Outer qigong focuses on physical strengthening, inner qigong with nourishing the internal organs and gathering and conserving energy, and secret qigong with dissolving the duality of mind and body to merge with the primordial energy of the Dao. During 4 days, Samten Kobelt will present Levels 1, 2 and 3. No previous experience is necessary. This programme is taught in English. it will include talks, detailed instruction, Q & A, and lots of qigong practice in the lineage of Eva Wong. Samten Kobelt grew up near Zurich, Switzerland, where he again resides since 2013. In 1984 he met the Shambhala teachings at Naropa University. Samten spent 10 years at the major Shambhala land centers in North America. He served for six years as Director of Marpa House and three years as a shastri at the Boulder Shambhala Center. Samten is practicing and teaching Contemplative Dance Practice, developed by Barbara Dilley; Lujong (Tibetan Yoga) transmitted by Khenpo Tsultrim Gyamtso Rinpoche; Bugaku (Japanese Court Dance) from Togi Sensei through Arawana Hayashi; and Qigong in the lineage of Eva Wong. Language : This retreat will be in taught in English and with italian translation.